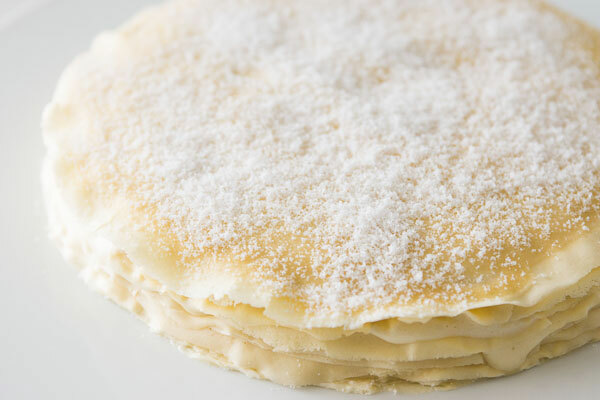 Gâteau Mille Crêpes is a classic French cake that translates to “thousand crêpe cake”. It’s the perfect dessert for people (like me) who have a rancorous relationship with their ovens because it’s made entirely on the stove. 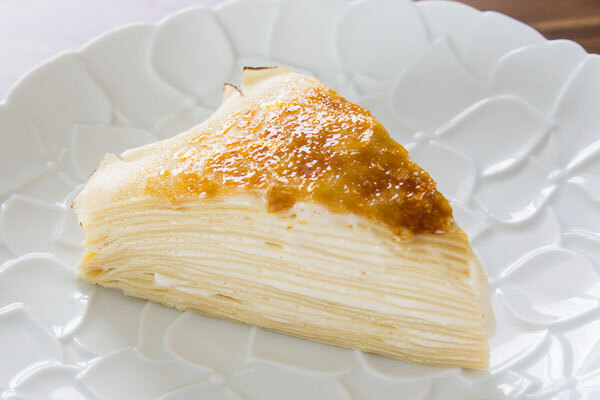 The crêpes are layered with maple-scotch pastry cream to form a layer cake, and the top of the cake is covered in a thin layer of crisp caramelized sugar. It’s dense, creamy, moist and flavorful, with a delightful array of textures in each bite. While it may not have a thousand layers, making twenty crêpes can take a bit of time. One whiff of the buttery maple aroma these crêpes give off as they’re cooking though and I guarantee you won’t have any regrets. Here are a few tricks that will have you making perfectly round crêpes in no time. The first thing is that you’re going to want to use a heavy bottomed non-stick pan. The heavy bottom helps distribute the heat evenly, preventing the center from burning, and the non-stick coating will make your life much easier. The second thing is that getting the temperature of the pan right is very important. If the pan is too hot, the crêpe batter will solidify before you have a chance to swirl it around. If it’s too cold, the crêpe will have a tendency to stick to the pan (though this is less of an issue if you use a non-stick pan). Lastly, measure out the crêpe batter in a small liquid measuring cup (the type that holds up to a quarter cup). This will help ensure that every crêpe is the same size and thickness. Don’t worry if they don’t all look perfect, as long as you have 1 good looking crêpe (for the top) your cake will look beautiful. Gâteau Mille Crêpes is a classic French cake recipe. 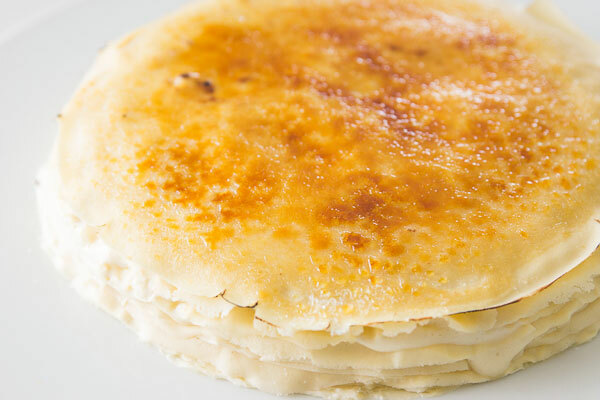 The crêpes are layered with maple-scotch pastry cream and covered in caramelized sugar. 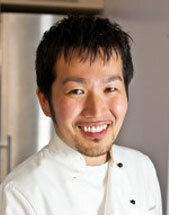 Food blogger Marc Matsumoto explains the technique for making crêpes in a full post on the Fresh Tastes blog. Put the melted butter and eggs into a blender and blend until emulsified. Add the flour, milk, maple syrup and salt to the blender and blend until smooth. Refrigerate overnight. Heat a heavy bottomed 9” non-stick pan over medium low-heat until hot. Butter the pan, then use a paper towel to wipe out the extra butter. The surface of the pan should be slick but there shouldn’t be any pools of butter. 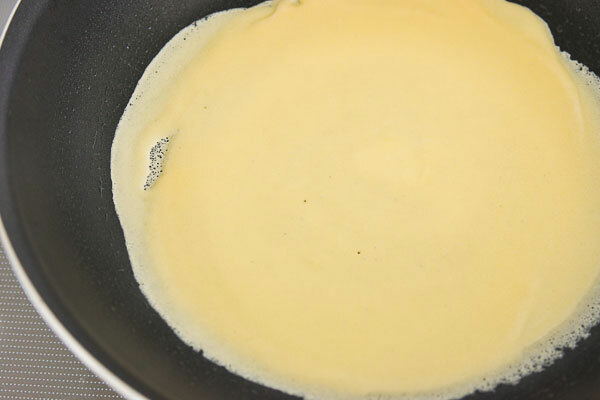 Add 2 tablespoons of batter to the center of the pan, and then quickly swirl the batter around to make a crêpe the size of the bottom of the pan. If the batter solidifies before you’re able to spread the batter out, your pan might be too hot. Try keeping the pan off the heat for a few second before you add the batter. When the crêpe no longer appears wet on top it's ready to flip. Use the corner of a spatula to peel up an edge, and then carefully use your fingers and spatula to peel away and flip the crêpe. The edge of the crêpe should be dry enough that it shouldn't be too hot, but be careful not to burn yourself on the pan. The crêpe should only need 15-20 seconds on the second side to cook through. 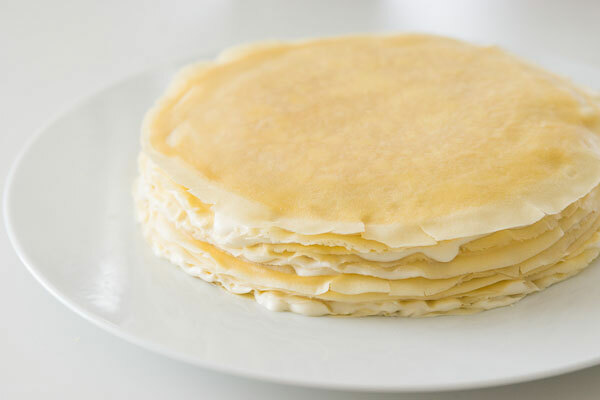 Transfer the cooked crêpe to a plate (stack the crêpes on top of each other to prevent them from drying out), and then continue making the rest of the crêpes. 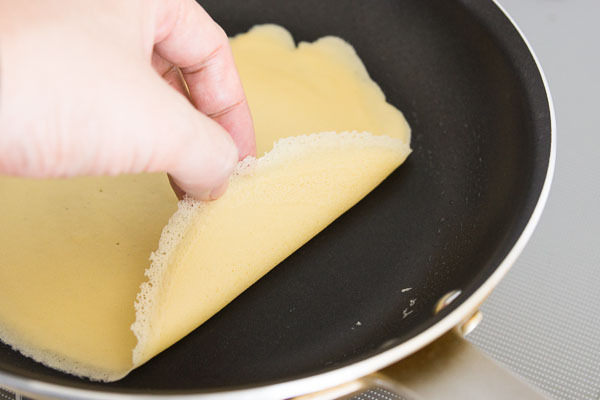 If the non-stick coating on your pan isn’t damaged you shouldn’t need to butter the pan again, but if the crêpes start sticking to the pan, keep buttering the pan. Make the custard while you wait for the crêpe to cool completely. Add the milk, eggs, maple syrup and cornstarch into a blender and blend until smooth. Pour the mixture into a heavy bottomed pot and heat over medium low heat while stirring constantly until it thickens (160 degrees F or 71 degrees C). Immediately remove the custard from the heat and then stir in the Scotch. Let the custard cool completely. You can speed this up by placing the pot in a bowl of ice water and stirring the custard. Whip the cream, and then add the powdered sugar when the cream starts holding soft peaks. Continue whipping until it holds firm peaks, but be careful not to over whip the cream or the fat will start to separate. Gently fold the whipped cream into the cooled custard using a spatula. If the pastry cream is loose, place it in the fridge to firm up. To assemble the cake, put a crêpe down on a flat plate or serving platter, then spread an even layer of cream about the thickness of the crêpe. If you make the layer too thin, there won't be enough cream in the cake. If you make it too thick, the cake won't hold its shape when you go to cut it. There should be plenty of pastry cream, so don’t worry about running out, but don’t try to use it all. Continue layering, saving the best-looking crêpe for the top layer. 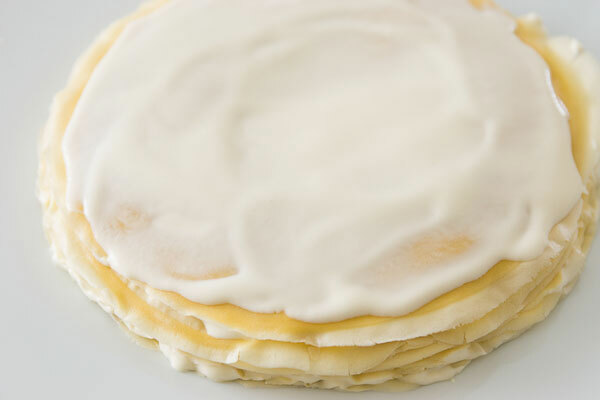 Once your cake is assembled, cover and refrigerate it for at least 4 hours or overnight to allow the moisture from the pastry cream to redistribute into the crêpes. To finish the cake, sprinkle 2 tablespoons of granulated sugar on top of the cake in an even layer (passing it through a wire sieve makes this easier). Use a kitchen torch to brûlée the sugar. It’s important that you do this quickly otherwise the cream below will start melting. Hold the torch at a 90 degree angle to the top of the cake, then use a small circular motion working your way around the cake to evenly caramelize the sugar without burning the cake.